.035" Over- 4.155" Bore, 461 cu.in., .065" Over- 4.185" Bore, 468 cu.in. 7/16” ARP 8740 capscrew rod bolts (ARP 2000 & L19 available). Forged 4032 Mahle pistons and plasma-moly file fit rings. Designed for internal balance with no heavy metal needed. All assemblies are internally balanced and require a neutral balanced flexplate or flywheel and harmonic balancer. Forged Cranks offer a tremendous advantage in strength and durability over cast cranks. This is very inexpensive insurance to protect your engine and even if its not needed at your current horsepower level now. Upgrading to a forged crank to build a solid bottom end will give you the option to safely upgrade performance and increase horsepower without having to worry about costly breakdowns in the future. Butler Performance chooses to start Bore Size options for rotating assemblies, short blocks, long blocks, and engines at .030" to .035" over. Most engines have normal wear and machining the block and honing the cylinders to .030"-.035" over will ensure that you have a good foundation to install your assembly into. 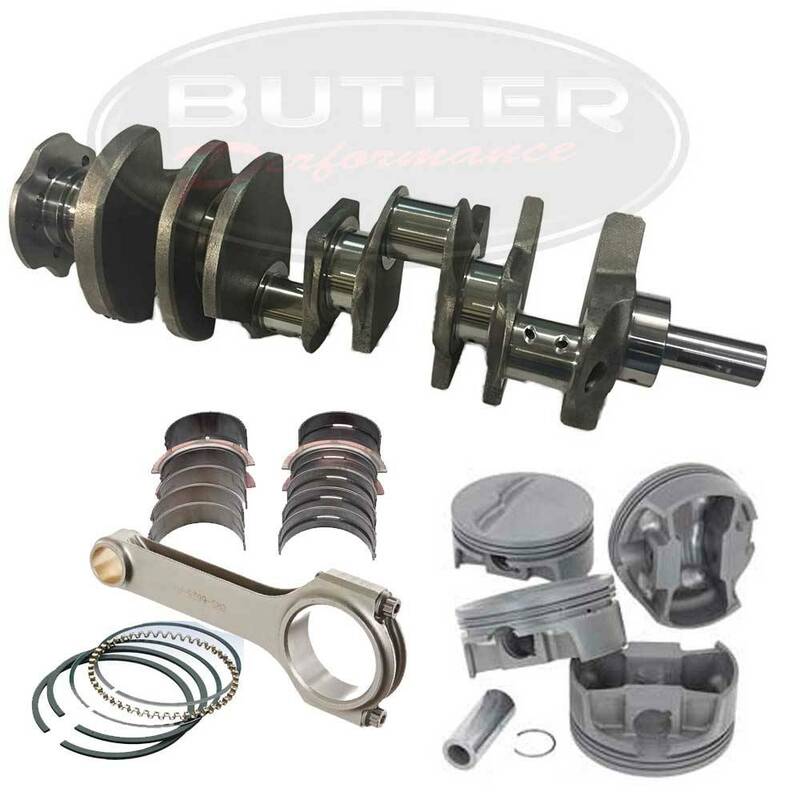 This ensures the pistons and rings will seat properly and be within specs and tolerances for building an engine capable of performance, horsepower, and longevity usually found in a Butler Engine. ESP Armor is a revolutionary new surface finishing process that is available only through Eagle. Similar processes exist, but ESP armor is unique because it is NOT A COATING, nor is it a chemical etching process. ESP Armor is a unique surface finishing process that results in an incredibly slick surface. This has many benefits. First and foremost is reduce bearing friction. By giving the oil a slicker surface to slide along, the bearing friction is reduced. This will also be evident in slower oil heating, reduced windage losses, and improved corrosion resistance. You will also notice that your bearings will live longer as a result of ESP Armor. The finish is unmistakable. Although it resembles chrome, it is not a coating that might flake off or wear out. Eagle is so confident in the effects ESP Armor has on our rods and cranks that we include a ONE YEAR LIMITED WARRANTY against breakage when ESP Armor is used on any 4340 steel crankshaft or H-beam rod. Many customers have tried it and all have been not only pleased, but surprised by the results. You’ve got to see it, and use it, to believe it!